If you're like I was, you might not immediately know what "The Curious Garden" is about,what it represents, what its intention is. 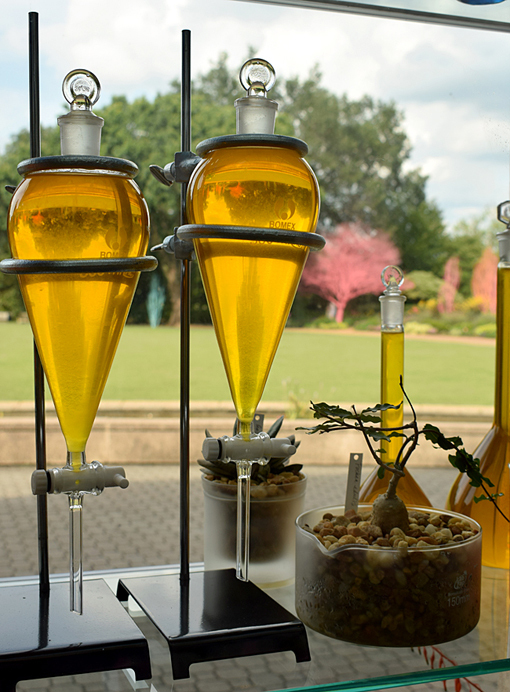 Well, intent aside, this Atlanta Botanical Garden exhibition is absolutely fantastic! 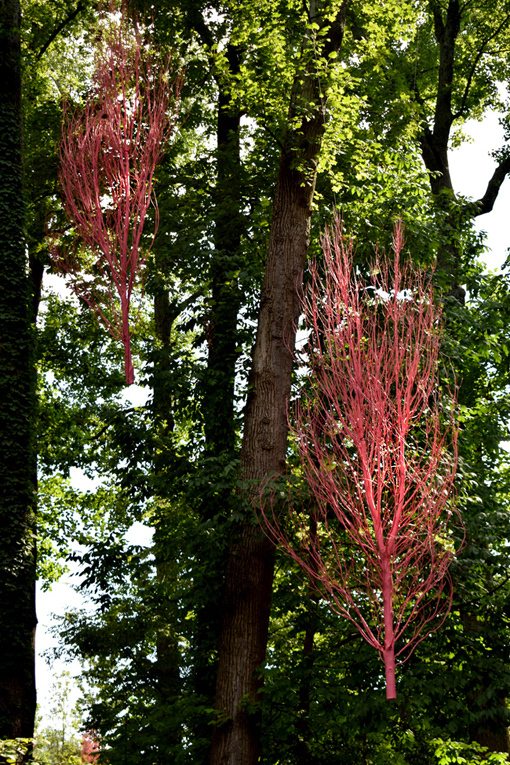 The 11 site-specific installations were created to not only help tell the story of the Garden's plant collections and conservation efforts, it's intended to provoke discussions and questions about nature...and it does exactly that, along with mesmerizing one with bold color, clever displays, and quite a few "curious" discoveries. "dilating pupils" is my personal favorite of the 11 installations. For the first time since the the Canopy Walk opened in 2010, Garden visitors are akin to NYC tourists gazing at skyscrapers...all eyes up! And they're my favorite color, a stunning contrast to the surrounding ocean of green leaves. The question this display begs is, "How deep and wide do the roots of these trees extend as water fuels their highest branch and leaf?" Ponder that knowing that these are some of Atlanta's oldest hardwoods. The approximately two dozen discs and ovals in this display range in diameter from 4 feet to 15 feet...they're huge, and yet the float. "chalices" is stunning! I first thought these bright, shining cylinders were made of various colors of acrylic or some other synthetic material, but they're tubes filled with colored water! Knowing that, this installation's name makes total sense, and makes it even more exquisitely elegant. You'll find "chalices" in the Low Elevation Orchid Display House in the Fuqua Orchid Center. Be sure to meander through the entirety of this space...the orchids and other plantings are marvels in and of themselves. 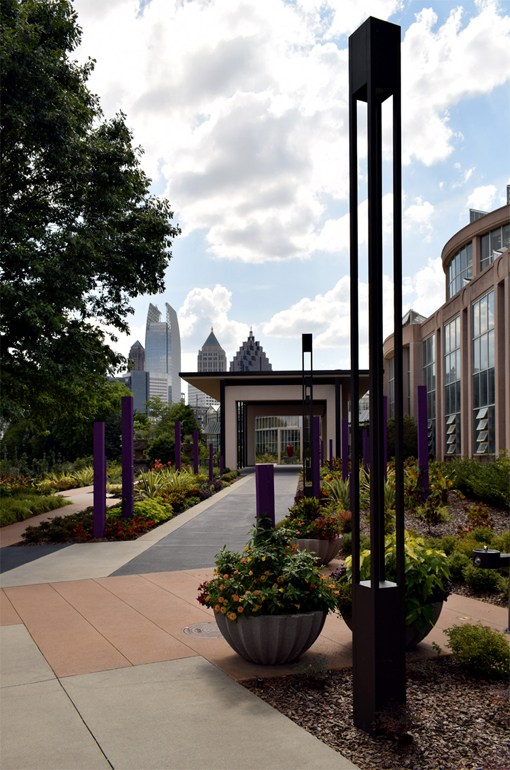 "totems", a collection of approximately 40 purple columns, are interspersed throughout the Anne Cox Chambers Flower Walk that leads to the new Robinson Gazebo, which overlooks the new Skyline Garden. They're reflective of the Atlanta skyline, seen in the not-too-far distance. The new Skyline Garden is mind-blowing spectacular! I've been visiting the Atlanta Botanical Garden since 1987, two years before the Conservatory opened. This transformation is absolutely remarkable. I think you'll find this garden as stunning as I do, even if you didn't see what it was before, which was great, but this is grand! "floating fiddlehead" is an abstraction of fiddlehead ferns (which are edible) manifest as a French parterre garden, quietly floating on the Aquatic Plant Pond. This is only one of the stunning attributes of the new Skyline Garden, an area that once was an oft-missed part of the Garden today is a destination. 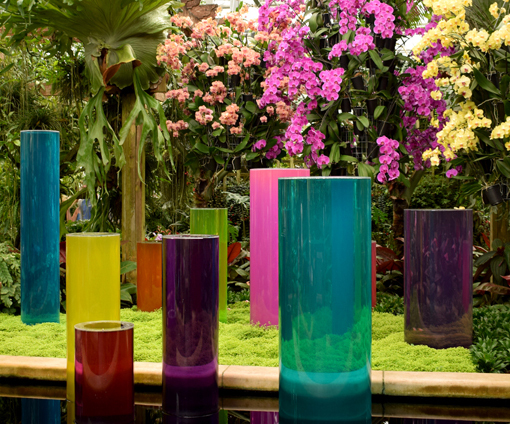 "flora lab" is a rainbow of glass labware and plants that speak to the Garden's conservation efforts. Did you know that the Garden is deeply involved in orchid conservation, as well as amphibian conservation? Some of the plant species are so precious and rare that they're not on display. It's quite fascinating what goes on behind the scenes. If you're interested in learning more, about getting involved, volunteering is a great way to do just that! I volunteered here for 4.5 years as a docent and will forever cherish the connection to the Garden that experience afforded me. Cocktails in the Garden is back! For the last two summers, the Garden hosted "brilliant" exhibitions including a Chihuly exhibition marking the Garden's 40th anniversary last year. They were on display nearly every evening of the week. I've missed Cocktail in the Garden—Atlanta's favorite garden party—especially as a member...members get to attend Cocktails in the Garden free! It's a wonderful and fun way to explore our "oasis in the city" on a more frequent basis. Never been to Cocktails in the Garden? You're missing out! Come to one soon because I'd bet that you'll want to come again (and again) before the end of October. You get to see "The Curious Garden" during twilight, sunset, and after dark—the displays are dramatically lit! There is live music, cash bars, and games for grown-ups! And Longleaf, the Garden's onsite restaurant open only to Garden visitors, is serving a special dinner menu during Cocktails in the Garden. Reservations are recommended. Come out and play Thursdays 6:00 p.m. - 10:00 p.m. It's free for members! 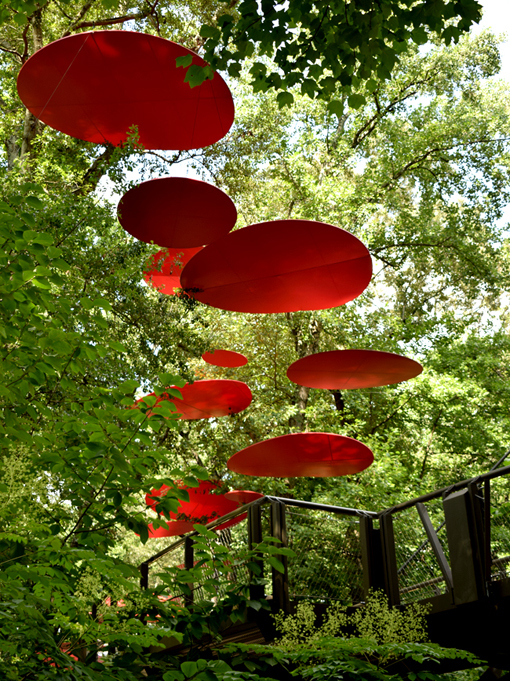 "the spirited bosk" is an installation that spans from the Fern Dell to The Great Lawn! You'll enjoy about 100 trees painted the colors of ice cream, some of them "planted" in rather surprising places. Guest artist and designer of "The Curious Garden", Adam Schwerner is director of Disneyland Resort Horticulture & Resort Enhancement. He was previously director of the Chicago Park District's Department of Cultural and Natural Resources. As a person who spearheaded initiatives to increase the presence of art in city parks, he's an obvious natural for this year's spring/summer exhibition. In a statement, Adam said, "All my life I have pursued my dual loves of art and horticulture. With this series of site-specific art installations and the gardens, there is a coming together of these two great pursuits." "antebellum aerophyte" is a multifaceted display that honors the agrarian South, at a time when "nature has won the battle". 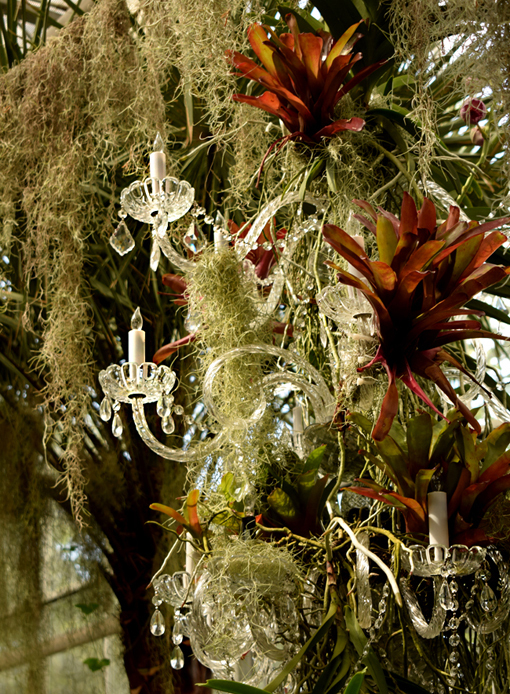 Again, the eyes are drawn skyward exploring the vast collection of crystal chandeliers overtaken by plant life.Located in the Fuqua Orchid Center's lobby, spend time here exploring...and ask questions! "sunflowers" is a field of neck-bending sunflowers planted in the Edible Garden, appropriately so. 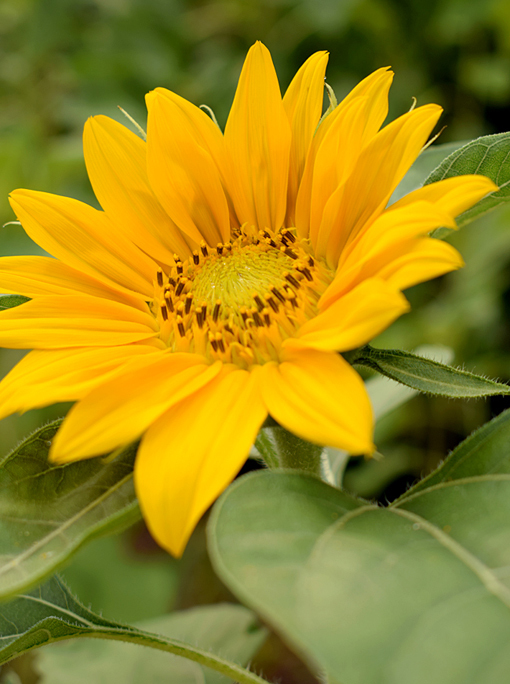 No matter what your favorite flower is, you can't deny an attention-worthy crop of sunflowers and you can't help but feel even a little joy at their sight. This installation is about the "sustainable South", which is awesome, but for me it's about bright, engaging color. It's about a more-than-strong connection with nature. I don't think even this year's rare total solar eclipse can dampen these bright, beautiful, sun-loving gems! "the white garden" is a transformed Levy Parterre, where the famed blue Chihuly has called home and posed for an infinite number of photographs since 2004. This garden pays homage to the famed white garden at Sissinghurst Castle in England. I'm in love with the GIANT planters used in this display! 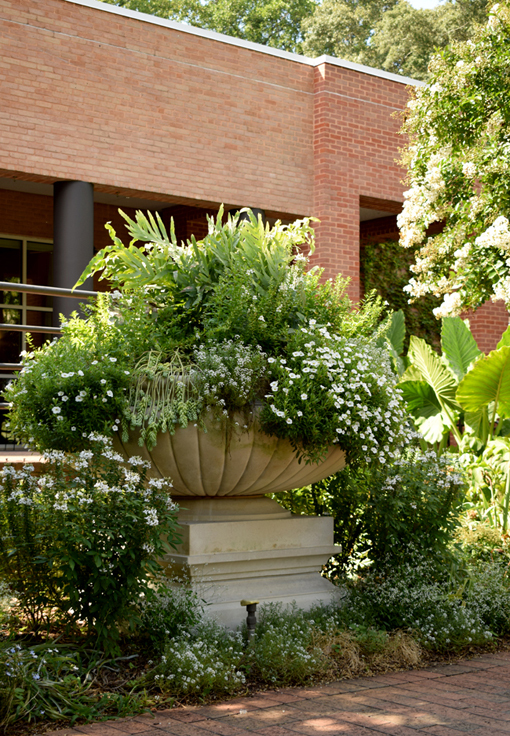 This installation is nearly 100 percent white-flowering plants and complimentary foliage in varying shades of green, white, gray and silver. The plants on display will be refreshed twice per month during the run of the show, a nod to the Garden's conservation efforts. "the mountain flows/the river sits" is another of my favorite installations. 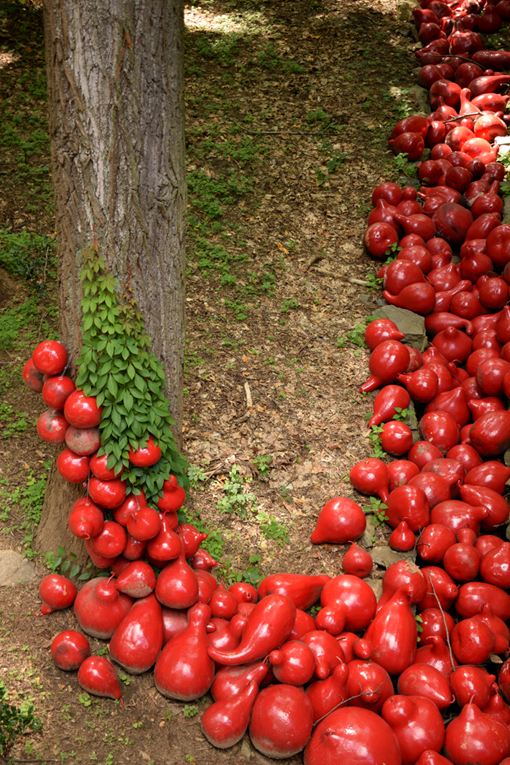 You will see an astounding collection of 1,200 painted gourds, all of them glossy red! They cover a generous portion of the rolling terrain of Storza Woods. This installation is a nod to the art of painted gourds, common in the South. I've seen some incredibly elaborate painted gourds in my time, but I've never, ever seen so many! 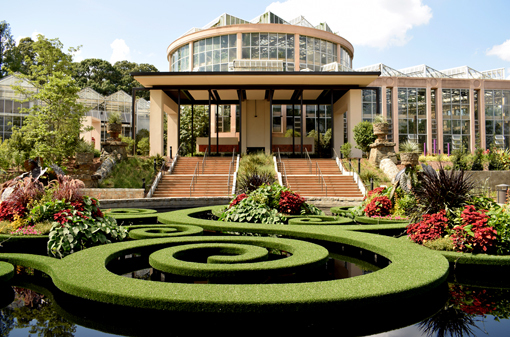 There you go...a peek at this year's Atlanta Botanical Garden's must-see spring/summer exhibition. "The Curious Garden" will be on display through Sunday, October 29, 2017, including Thursday nights during Cocktails in the Garden!